A young Plains Indian warrior prepares for a new day. 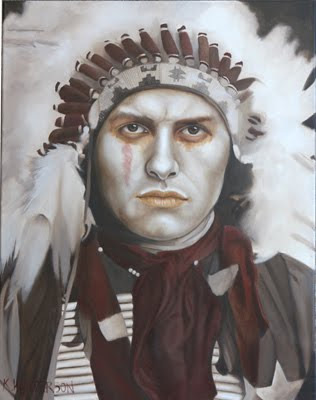 He wears a beaded, eagle feather bonnet and a red scarf. His hair is tied in Trade Cloth. His face is painted with white clay. A red tear symbolizes those that have fallen in battle. The colors of the painting are almost monochromatic earth colors. 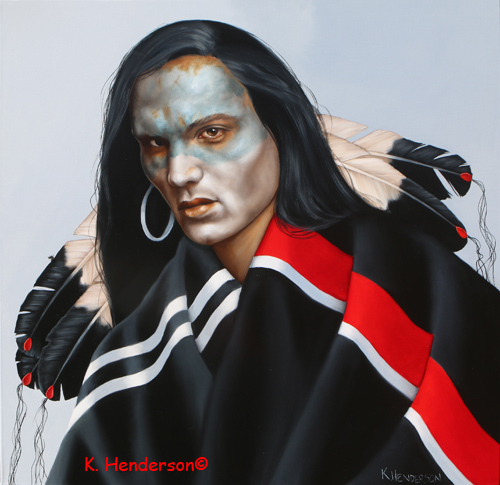 The title comes from an American Indian story that tells of the Raven rescuing the stolen sun and returning it to the sky. 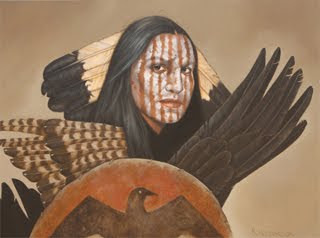 The Warrior wears feathers from many birds. His shield is painted with a bird image. He wears white stripes of paint on his face. This is based on a turn of last century photograph. 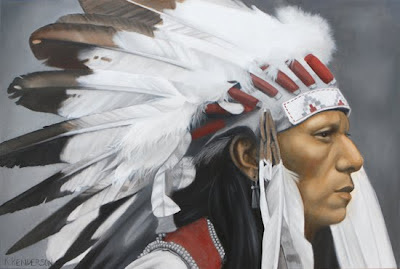 The Plains Indian is wearing a feathered bonnet with eagle feathers. Breastplates had originally been worn as armor and for protection in both battle and hunting. Later breastplates became a status symbol among many Native Americans. 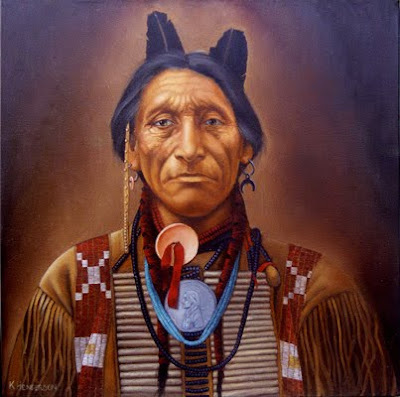 About the year 1880 the Plains Indians began to obtain a cheaper and much less fragile hair pipe. Trader Joseph H. Sherburne's first year of trade with the Ponca, had among his wares a quantity of corncob pipes. The corncob bowls were equipped with bone stems. These pipes sold readily but without comment from the Indians. Upon his next trip to the Ponca, Mr. Sherburne found the corncob pipes in great demand. 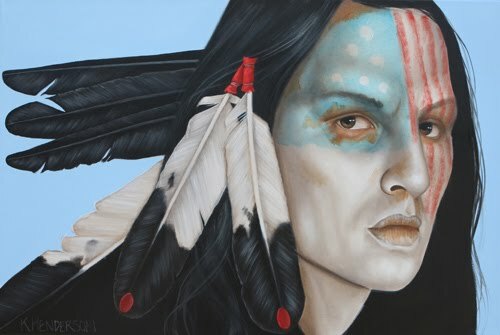 White Eagle, chief of the tribe, showed him an elaborate neck ornament made of the bone stems of the pipes strung on buckskin thongs. He wanted more pipestems in quantity. This began the commerical trade of the 'hair pipe'.